"Sometimes your joy is the source of your smile, but sometimes your smile can be the source of your joy." This quote by Thich Nhat Hanh, Vietnamese-born Buddhist monk, teacher, author, and peace and social justice activist who helped originate the "Engaged Buddhism" movement, expresses the very essence of the author and his extensive writings and teachings. His lifelong efforts to generate peace and reconciliation moved Martin Luther King, Jr. to nominate him for the Nobel Peace Prize in 1967. In Happiness, he shares with readers simple practices to bring us into the present moment and develop a sense of peace and mindful awareness in our everyday lives. Throughout this beautiful book, his own enchanting smile, warmth and insight shine through. A great gift for anyone you love! The haunting call of a loon piercing the stillness captivates anyone who has ever heard it. 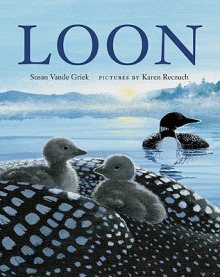 This gorgeously designed and illustrated book is the story of two loon chicks who hatch in June. We follow their life and antics until, finally as adults, they make their way north to a distant, deep, fishing lake, find a mate and start a new generation. One reviewer said it best, "[t]his is both a book about birds...the common loon whose plaintive call brings joy and peace to many who live on, or near, the lakes where they raise their young. It is also a book of art...beautifully rendered details in acrylic on canvas, lending depth and texture to the world of the loon. We see that world from the loon's perspective, from a distance, up close, and even into the watery depths. It is a celebration of all that we can see and learn when we take time to wonder about the mysteries of nature." One of our favorite children's books! Well...Fall is here - or is it? It's been an Indian Summer of clear days and temperatures in the 70's and even 80's. Perhaps we can't really call it Fall until AppleFest is behind us. For the uninitiated, AppleFest is Bayfield's annual celebration of "everything apples." Celebrating its 50th anniversary this year, AppleFest has been touted as Wisconsin's "best" festival by Wisconsin Trails Magazine and listed among the top ten Autumn festivals in North America by the Society of American Travel Writers and among the top ten favorite small town festivals by Discover Wisconsin. Last year it attracted 50,000 visitors to our little city of 611 people! When the last of those 50,000 head out of town on Highway 13, our focus begins to turn inward and we settled in to await the quiet comfort of Winter. We watch the colors peak and recede. We get the woodshed filled. We remove the front loader and hook up the snow blower. We can and freeze the last remnants of the harvest. And maybe, at last, we pick up a book. Mostly, that is a solitary act, but we do it in company, too. Our Apostle Islands Booksellers Book Group will meet again this year with the readings chosen by the group as we go along. We will also be adding a men's reading and discussion group focused upon books which probe the tensions where diverse cultures, nationalities, races and religions rub up against each other in a wide variety of geographies. There will be six books (one a month) plus a bonus for April. They will be: Cry the Beloved Country by Alan Paton (South Africa); Halfway Man by Wayland Drew (Canada); Beyond a Boundary by C.L.R. James (West Indies); The Lemon Tree by Sandy Tolan (Israel/Palestine); The Bridge on the Drina by Ivo Andric (Bosnia); and The Spirit Catches You and You Fall Down by Anne Fadiman (United States). The bonus session will be Wingshooters by Nina Revoyr (Wisconsin) and a free copy of this last book will go to all who have made the first six meetings. There will be ten places in the group allotted on a first-come basis. We look forward to seeing many of you during the quieter months. Bestselling author of Savoring the Seasons of the Northern Heartland, brings us over 200 new recipes for the harvest peppered with interesting bits of advice and insight from local farmers and producers in The Northern Heartland Kitchen. Be sure to stop by before the Apple Festival parade and pick up your signed copy. William Kent Krueger and his Cork O'Connor series will be returning to Bayfield this Fall. Celebrating the release of his latest adventure, Northwest Angle. In regard to Northwest Angle,the ever-gracious Charlaine Harris has said: "William Kent Krueger can't write a bad book. Northwest Angle is one of his best. A complex crime novel that contains meditations on the difficulties of loving and the paths we take to reach God, this Cork O'Connor novel has everything you want in a great read: depth, action, and credibility." Once again Kent will be reading from his latest novel at the Big Water Cafe & Coffee Roasters at 3pm on October 22nd. There will be a signing to follow at Apostle Islands Booksellers. Two recent books - Long Shining Waters by Danielle Sosin and Safe from the Sea by Peter Geye (both of whom have read and signed at our store) - are set squarely in the heart of Lake Superior. I asked an erudite friend recently what other books (there seemed so few!) had a similar Lake Superior setting. He suggested Halfway Man by Wayland Drew. Bingo! What a great book! The narrator is a college-educated Ojibwe, Travis Nikigwun, who has returned to his bush village to live and work seasonal jobs. The land on which the village - Neyashing - is situated falls into the hands of developers who plan an upscale resort community. The People will have to leave their ancestral home. Travis undertakes an elegant strategy which turns the tide. The parallel love story with his college sweetheart, Jenny - a radical eco-activist - provides an important counterpoint to the central story line. The leaves are changing and beginning to fall. The season in Bayfield is definitely quieting down. Howard Paap is a local author of A Northern Land and Raspberry River. Below is an excerpt from a chapter in A Northern Land entitled, "Empty Nets." "It was an unseasonably warm October morning, the warmth matched by the stillness. There was not a hint of breeze, and the river's movement was difficult to detect. The only ripples were caused by the crude oar and the minor wake from our boat. It was as if the water were a solid instead of a liquid and we were slowly poling our way over the buoyant mass. An enticing veil of morning fog lay here and there on the river, never with enough substance to block the view, but just enough to add a welcome mysticism to the scene. It was the sort of ethereal fog, similar in this way to the night's lingering remnants, that would instantly be burned away by the early sun's rays. The shores of the river were lined with orange and red maples, yellow aspens, and dark emerald hemlocks, balsams, spruces and pines. The scene had a presence. It was beyond mere water, trees, sky and air. It had gone beyond the confines of its own physical being into something more. Such a morning, I concluded, was not for mortals. We were venturing out onto a river, a river in the forest of the center of the universe. I imagined the mythical manidoog perched among the branches along the shores, silently watching us move by. They clustered among the bright oranges and reds, were scattered in the yellows of the aspens, and found spaces to rest on the branches of the large hemlocks. These other-than-human persons lived in this silent place, and they were sleepily letting us enter their realm."